Perfect on its own or with ginger ale. Alternatively, to create a moreish apple pie flavour, serve with apple juice. 1. 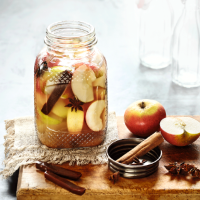 Pour the Waitrose Vodka into a large screw-top Kilner jar and add the apple wedges, chewy toffee, caster sugar, star anise and cinnamon stick. 2. Shake every so often until the chewy toffee has dissolved, then leave for a further 4-5 days in a cool dry place, shaking occasionally, for the flavours to permeate. 3. Strain through a sieve and pour into sterilised bottles. This recipe was first published in December 2014.